The Bright River shouldn’t even be called the Bright River, you know? Because that’s not even how rivers work. It should be this one. And then you go up to it the next day and it’s this one. A few years later, Wayne’s body is found in the woods near that river. His death becomes the central mystery of Ben’s life. Ben is a natural puzzle solver. As a child he was labeled gifted, not because he was a good student but because he was “an amazing test taker,” able to “listen” and “hear the truth in the background” of the questions. Yet Wayne’s death is a conundrum which Ben has been unable to solve: why did Wayne go up to the woods in the middle of winter? How, exactly, did he die? As an adult, Ben has been shiftless, tearing through his trust fund, fighting addiction, spending time in jail for a stupid crime. After twelve years away, he returns to his hometown of St. Helens, Wisconsin to clean up and sell the house of his recently deceased uncle Denny, Wayne’s father. Taking care of the house is a task no other family member wants; his parents have asked Ben to do it, and share in the profits from the house sale, as a form of redemption. Ben feels “an opposing force coming from St. Helens, as though it might not want me in it, or might not want me back.” He has duties to perform for Denny and for Wayne, and so he has no choice but to submerge himself. The town has changed, yet everywhere he finds reminders of the way things used to be, including encountering Lauren Sheehan. Ben knew Lauren as an awkward girl who was thought of as a child “genius” by the town. Now she has returned to St. Helens as a beautiful but still aloof woman with a set of fiercely guarded secrets — another riddle for Ben to attempt to solve. Like a river, the story branches off, moving from present to past, switching between Ben and Lauren’s voices. Or you could view the structure as a puzzle where information is revealed slowly, the reader handed one clue at a time, not necessarily in logical order. Some of Ben and Lauren’s memories are vital to the plot; others are not. Instead, they are just what they are: those simple, stunning moments a person holds close for no other reason than to recall how life was. “Here is something,” the reader is told repeatedly before a scene, as if about to be handed a gift. The narration has a few moments of self-consciousness early on. In the first chapter told from Lauren’s point of view, she stops to say, “This is Lauren,” as if the reader can’t figure it out. For the most part, though, the structure works well. We are embedded in Ben and Lauren’s struggle by moving through their thought processes, from the memories they choose to linger on to those they close off or reluctantly tell. It becomes clear that for them the experiences of the past have a direct impact on the present: Lauren cannot escape her ex-husband and Ben cannot lay Wayne’s death to rest until they have traced both currents back to their sources. The one disappointment is the resolution of Lauren’s story. The answer to that puzzle seems too easy, and so the consequences become lost, as the novel switches focus back to Wayne’s death and Ben’s narrative. The build up of Lauren’s story is so intense that I would have liked to feel the ripples more distinctly. 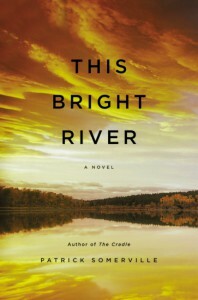 Regardless, This Bright River is satisfying; it’s a page turner with the suspense and plot twists of a good thriller. By taking the reader so close to his two protagonists, Patrick Somerville creates a lasting emotional impact: you care deeply about what happens to Ben and Lauren and are rooting for them to solve their respective mysteries and become happier, healthier people. “It was always there, a quiet river in the background that only sometimes overflowed, flooded over, say, every four or five years, when the rains were heavy or the snowfall in some other county, or country, or season led from this to that.” The river metaphor and carefully constructed architecture, while obvious in their intent, never become so obtrusive as to detract from the storyline.